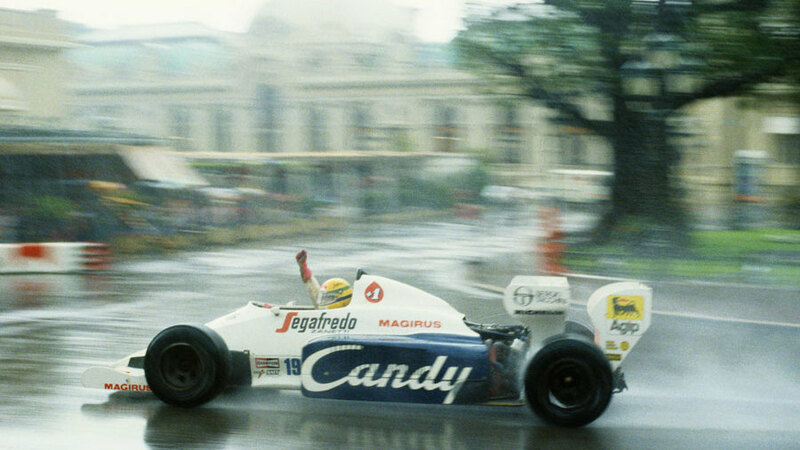 Championship leader Alain Prost won the Monaco Grand Prix but it was the performance of rookie Ayrton Senna in his Toleman which grabbed all the headlines and marked him out as one to watch. The start of the race was delayed by 45 minutes because of torrential rain and so bad were the conditions that stewards ordered water to be poured into the tunnel as they feared the change from near waterlogging to a dry track could cause handling difficulties. Prost made the best start on a day when being on pole was a massive advantage and behind him the almost inevitable accidents accounted for Renault team-mates Derek Warwick and Patrick Tambay; Tambay missed the next race weekend in Canada as a result. On the ninth lap Prost was passed by Nigel Mansell's Lotus when his McLaren was baulked by Corrado Fabi's motionless Brabham, but six laps later Mansell lost grip on a painted line at Casino Square and the resulting impact with a barrier forced him out. "I've never driven before in such diabolical conditions," Mansell said. "But at least I've led my first grand prix and you can be sure it won't be my last." Prost returned to the lead but found Senna, who had started 13th, was eating into his lead at a rate of almost five seconds a lap in what was reckoned to be an uncompetitive Toleman. Rattled, Prost signalled at the end of the 29th lap to the stewards he thought conditions were bad enough for the race to be stopped but Senna was having no such problems, nor was another rookie, Stefan Bellof in a Tyrell, in third. Two laps later Prost again indicated he was unhappy and this time former F1 driver and clerk of the course Jacky Ickx agreed and at the end of the following lap the red flag was shown. As Prost slowed on seeing the red flag, Senna shot past and euphorically claimed the victory. But the rules stated the positions at the last lap completed by all drivers counted and so Prost was declared winner with Senna second and Bellof third. What happened next was officialdom at its worst: The Automobile Club de Monaco's Michel Boeri, who wasn't an official of the meeting, sought his moment of glory so took it upon himself to show the chequered flag and end the race but at no point had a decision been made as to a restart. Had the cars been left on the grid, a restart sequence could have begun and then officials - namely Ickx - could have decided what should happen. Boeri scuppered any chance of a restart and handed Prost, Senna and Bellof a trip to the podium. There were also accusations the race had been stopped to ensure a Frenchman won. Added to the conspiracy theories was the fact that Ickx worked for Porsche and Prost's McLaren had a Porsche-designed engine. Ickx was subsequently suspended for not consulting with stewards before making his decision. It later emerged Senna had driven with fuel soaking into his overalls. "You don't think about pain," he said. "It was only after the race was stopped that I realised just how painful it had been." Defending world champion Nelson Piquet suffered his fifth DNF in six outings after stalling on the start line and retiring with electrical problems after 14 laps. For Bellof there was a cruel sting in the tail as Tyrrell were disqualified at the end of the season for fuel irregularities and all the team's results voided. He never again finished on the podium.